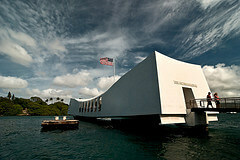 The USS Arizona memorial in Hawaii is perhaps one of the most historic memorials in the US. The event that caused the US to enter into world war II occurred at the site off the coast of Hawaii where the USS Arizona was sunken during the attacks on Pearl Harbor causing 1,177 soldiers to loose their lives. Anyone visiting Hawaii must make time to stop and see this memorial and pay tribute to those who served our country. The memorial, located in Oahu, is open 7 days a week from 7:00 a.m. to 5:00 p.m. There are also timed programs to the memorial that run from 7:45 AM to 3 PM. Expect there to be a crowd of visitors during the day as the memorial is one of the most visited spots in Hawaii by tourists. Last updated by LC on 18 September, 2011 in Destinations.